It's Monday evening and the main hall of the Egyptian Journalists Syndicate is packed with hundreds of supporters of Khaled Ali, Egypt's youngest presidential hopeful. Along with Ali, seven other would-be candidates have announced their intention to run in Egypt's first post-Mubarak presidential contest. Contenders for the country's highest office will formally register their candidacies in less than two weeks. Meanwhile, they have been campaigning extensively in hopes of bolstering their electoral prospects. The walls of the syndicate are covered with posters in support of Ali's campaign, hand drawn by workers from Tanta, Menoufiya, and other governorates throughout the country. At least two buses, which brought in some 100 farmers from throughout Egypt, can be seen parked outside. "Khaled Ali will rise, rise against capitalism," attendees chant upon Ali’s arrival. "Who is Khaled Ali? He's the farmers' favourite." Ali began his address to supporters by talking about how the rights of Egypt's economically underprivileged had yet to be realised, and how a minimum wage had not yet been set for a large number of Egyptian labourers – this despite a landmark court ruling in 2010, won by Ali, calling for a national minimum monthly wage of LE1,200. "Am I the candidate of the revolution? Am I the candidate of the young? No! I'm only one voice of many,” Ali declared from the podium. He went on to note how certain politicians and media figures had exploited Egypt's Tahrir Square revolution for their own short-term advantage. Workers responded to Ali's assertions by shouting: "A farmer; a humble man; a president from Tahrir!" A large portion of Ali's speech addressed the needs and entitlements of the Egyptian worker and farmer. He stressed that his primary focus as president would be on the renationalisation of Egyptian state assets. 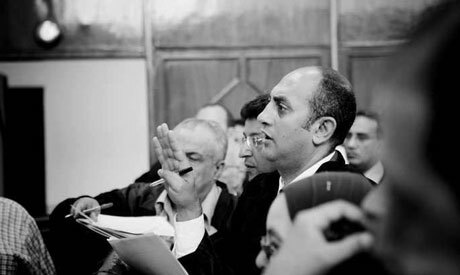 This issue is one for which Ali – a former head of the Egyptian Centre for Economic and Social Rights and the Cairo-based Hisham Mubarak Law Centre – has long fought for. In January of last year, the Shibin El-Kom Textiles Company and the Tanta for Flax and Oil Company were both renationalised after almost a decade under private ownership. He went on to stress, however, that he was not opposed to the principle of private property, without which "no society can properly develop." But he did issue calls for a mixed economy in which the public, private and cooperative sectors can all work in partnership so as to prevent price fixing and other monopolistic practices. Ali also pointed to the economic wealth accumulated by Egypt's ruling Supreme Council of the Armed Forces (SCAF), emphasising the need to renationalise factories and other assets currently owned by the Egyptian Armed Forces. “It is precisely this plethora of institutions they own that prevents them from properly carrying out their mandate," Ali asserted. Ali went on to explain that his political programme would be gradually unveiled over the course of next month. The first axis of his programme was announced at the conference, where he focused specifically on Egypt's mineral and agricultural wealth. He went on to say that foreign companies had exploited some 120 of Egypt's lucrative gold mines, stressing that a clear plan was needed to determine how such national mineral wealth would be used developed in the coming period. He also talked about the need to strengthen Egypt's economic relations with regional heavyweights Iran and Turkey. "We need economic cooperation between these three regional powers, with a view towards limiting American supremacy over our people," Ali declared. Lawyer Nashwa Zein El-Abedeen, who attended the event, said she supported Ali's presidential campaign based on the merits of his past achievements. "Social justice was the main demand of the revolution," she said. "And although it's been widely talked about, it has yet to be realised, since it's been overshadowed by the constitutional issue and parliamentary elections." Accountant Amr Saad, for his part, said he supported Ali not only for his past achievements, but also because the candidate represented the country's young people and labourers, who account for the bulk of Egypt’s population. "Real change will be felt within five years if Ali wins the presidency," Saad predicted. He went on to describe Ali as Egypt's "best option" for president, since he could be counted on to carry out badly-needed economic and social changes that would foster the emergence of a strong middle class. A good choice for President !! I wish you the best of luck in your bid for the Presidency....You have what it takes...Egypt will rise again ! !